Where can the euro be used? Euro banknotes and coins are legal tender in all 19 countries of the euro area. 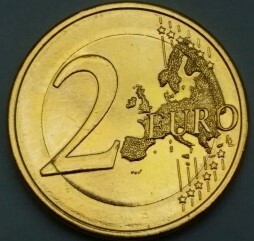 The euro has been in use in Austria, Belgium, Finland, France, Germany, Greece, Ireland, Italy, Luxembourg, the Netherlands, Portugal and Spain since 1 January 2002, in Slovenia since 1 January 2007, in Cyprus and Malta since 1 January 2008, in Slovakia since 1 January 2009, in Estonia since 1 January 2011, in Latvia since 1 January 2014 and in Lithuania since 1 January 2015. The euro is also legal tender in the French overseas departments (Guadeloupe, Martinique, French Guiana and Réunion) and territories (Saint-Barthélemy and Saint-Martin), the Azores, Madeira, the Canary Islands, Saint-Pierre-et-Miquelon, Mayotte, San Marino, the Vatican City, Monaco and Andorra. The euro is also used as legal tender in Montenegro and Kosovo. Where and how can tolars be exchanged for euros? Tolars can be exchanged free-of-charge at the Bank of Slovenia, at Štefanova ulica 1 in Ljubljana (Bank of Slovenia building, entrance opposite the Ministry of the Interior), between 9 am and 1 pm on all business days, and additionally between 2 pm and 3.30 pm on Wednesdays. The exchange rate is SIT 239.640 to the euro. There is no time limit for exchanging tolar banknotes, but the exchange of tolar coins at the Bank of Slovenia ceased on 03 January 2017. Tolar banknotes may also be sent by post for exchange into euros at the Bank of Slovenia (Cash Department). For more, see Exchange of tolares to euros. Can old German marks and other legacy currencies still be exchanged for euros? Because they are not the national currency, the process of exchanging the legacy currencies of euro area countries (German marks, Italian lire, French francs, etc.) is a paid service offered by commercial banks in Slovenia. You are advised to consult a commercial bank, where you will be given information about whether the currency can still be exchanged in Slovenia and what the commission is. Old banknotes and coins can still be exchanged in the majority of euro area countries at their central banks. This is the case for German marks, which can be exchanged at the German central bank commission-free and with no time limit. For more information, see the website of the German central bank. The national central banks of the euro area were all still exchanging their national banknotes and coins, and some have no time limit. For more information, see the table of national scenarios for cash exchange in the euro area. What exchange rates apply to the euro area legacy currencies? The exchange rates for converting the legacy currencies of euro area countries into euros were set out by Council Regulation (EC) No 2866/98 of 31 December 1998 on the conversion rates between the euro and the currencies of the Member States adopting the euro, or later by Regulation (EC) No 1478/2000 of 19 June 2000 for Greece, Regulation (EC) No 1086/2006 of 11 July 2006 amending Regulation (EC) No 2866/98 for Slovenia, Regulation (EC) No 1134/2007 of 10 July 2007 amending Regulation (EC) No 2866/98 for Malta, Regulation (EC) No 1135/2007 of 10 July 2007 amending Regulation (EC) No 2866/98 for Cyprus, and Regulation (EC) No 694/2008 of 8 July 2008 amending Regulation (EC) No 2866/98 for Slovakia. Corresponding regulations were also issued when the euro was adopted by Estonia, Latvia and Lithuania. The tolar exchange rate is SIT 239.640 to the euro, effective as of Slovenia’s adoption of the euro on 1 January 2007. The exchange rate was set out by Council Regulation (EC) No 1086/2006 of 11 July 2006 amending Regulation (EC) No 2866/98 on the conversion rates between the euro and the currencies of the Member States adopting the euro. Can the complete set of all eight euro coins (€1, €2 and 1, 2, 5, 10, 20 and 50 cents) be purchased at the Bank of Slovenia? 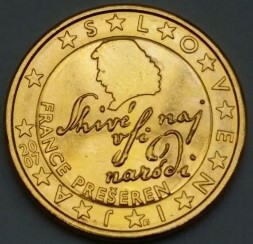 The complete set of eight euro coins with the Slovenian national designs has been on sale at the Bank of Slovenia since 15 December 2006. You are advised to enquire at a commercial bank, where you will be given the relevant information as to whether the coins can also be purchased there. For new EU Member States to join the euro, they have to attain a high level of economic convergence. Economic convergence is assessed on the basis of the Maastricht convergence criteria, which are defined in Article 140(1) of the Treaty on the Functioning of the European Union and in the Protocol on the convergence criteria. The achievement of a high degree of price stability. The inflation rate may not exceed by more than 1.5 percentage points the average of the inflation rates in the three best performing Member States in terms of price stability. The sustainability of the government financial position. The general government deficit may not exceed 3% of GDP, unless the ratio has declined substantially and continuously and reached a level that comes close to the reference value, or the excess over the reference value is only exceptional and temporary and the ratio remains close to the reference value. Government debt may not exceed 60% of GDP, unless the ratio is sufficiently diminishing and approaching the reference value at a satisfactory pace. The durability of convergence. The long-term interest rate may not exceed by more than 2 percentage points that of, at most, the three best performing Member States in terms of price stability. The observance of the normal fluctuation margins provided for by the exchange-rate mechanism of the European Monetary System, for at least two years, without devaluing against the euro. n the relevant information as to whether the coins can also be purchased there. When did Slovenia join the euro? The Bank of Slovenia and the government were committed to joining the euro at the earliest opportunity. 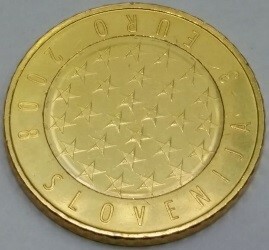 Having met all of the convergence criteria, Slovenia joined the euro on 1 January 2007. The exchange rate is SIT 239.640 to the euro. More information Introduction of the euro in Slovenia. Kateri priložnostni kovanci in/ali numizmatični izdelki Banke Slovenije bodo izdani ter predvidoma kdaj? Information about future releases and the projected dates of releases can be found on the Bank of Slovenia website at Numismatic news. Until when can tolar banknotes and coins be exchanged? Tolar banknotes may be exchanged at the Bank of Slovenia for an unlimited time. Tolar coins can be exchanged until 03 January 2017. Where can worn or damaged euro banknotes be replaced? Can foreign currency be exchanged for euros at the Bank of Slovenia at the official Bank of Slovenia exchange rate? The Bank of Slovenia does not provide any currency exchange services (with the exception of the replacement of tolar cash). Foreign currency may be exchanged at commercial banks and exchange offices. Where are the banknote reproduction rules published? The reproduction rules were published in the Decision of the European Central Bank on the denominations, specifications, reproduction, exchange and withdrawal of euro banknotes. Where can Yugoslav dinars be exchanged? Yugoslav dinars can no longer be exchanged at the Bank of Slovenia. What is value of "gold" or "green" €2 or €3 coins? 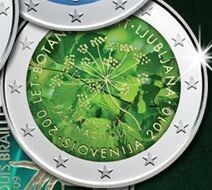 Neither the Bank of Slovenia nor the Republic of Slovenia has minted any gold or green €2 or €3 coins. The coins (depicted) are ordinary, bimetallic coins that have been coated with a yellow metal deposit or been stained green. This does not bring any increase in value. In accordance with Article 8(2) of Regulation (EU) 1210/2010, central banks are not required to exchange intentionally modified or damaged coins.